Do you want to use side-view actors as enemies? For example, maybe one of your actors decides to join the enemies, but you still want them to appear the same as they did when they were in your party! 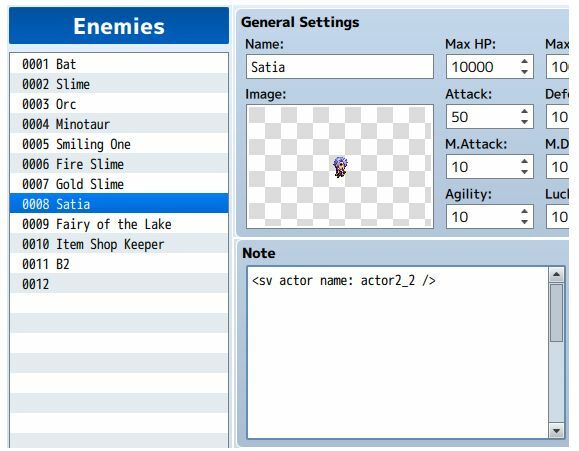 With this plugin, you can easily set up enemies to use side-view actor sprites. When they are preparing to cast a spell, they will begin chanting. When they die, they will fall over. Sideview Actor Enemy Weapons – add weapons animations for your enemies. Download ths plugin and place it in the “plugins” folder in your project’s “js” folder. Then open your Plugin Manager (F10), double-click an empty row, and select the HIME_SideviewActorEnemies plugin. If you would like to use the enemy weapons add-on, you will also need to install Enemy Equips, along with any requirements that it needs. Where the NAME is the filename of the SV Actor sprite that you want to use. The sideview actor image must be placed inside the sv_actors folder. You will notice that I don’t actually talk about the sv_enemies folder. This is because the image used here will be ignored during the game. Everything will remain the same for the enemy: you would set their positions in the troop editor as usual and the enemy will appear there, except using SV Actor sprites. You can take one of the sprites from the SV Actor spritesheet and use that as the enemy sprite in the database. This is only used as a placeholder for visual setup purposes. when my actors go to attack, the enemy actor turns their back to the player actors and stays that way and I don’t know how to fix it. I’ve used battler image set for the the note-tags. Can you do a video of how you do it? “You will notice that I don’t actually talk about the sv_enemies folder. This is because the image used here will be ignored during the game.” this description may be a bit missleading, you need to have any image selected from the sv enemies folder but it gets replaced by the sprite due to the note command. the image of the sprite you see in the guide, were the enemy is defined, does not appear when you follow those steps. For some reason, when I put in the note-tag, the sprite won’t appear in the image. my own villains. Thank you so much! For whatever reason, this plugin isn’t working at all when I try to use it. I followed the instructions as written, and nothing happened. My actor enemies are working but when they attack the weapons aren’t showing. I don’t get it, how do you use it? i can’t use it. wai. Just took another look, and that did prove true. I ensured that an enemy using a side view actor sprite would be casting a spell by only the only skill as setting a magic attack, and the motion works like normal. I also tested special conditions on enemy skills. Everything works like normal until you add special conditions to a skill on the enemy page. If an enemy has a skill set with a condition other than always, the enemy’s side view actor sprite locks up. This sounds like a bug, because the enemy should not be preparing to use a skill since they have no skills that they can use. Please check if it is a compatibility issue with another plugin by disabling other plugins. I’ve noticed that as soon as the battle command window opens, the enemies using side-view actor sprites completely freeze in the “wait” (as it’s called in rpg_sprites) motion. I also noticed that if you transform an enemy before the battle command window opens (Turn 0), the transformation works perfectly. I believe actor sprites freeze when they have picked a command and are waiting to use it. So i might just be being plain Dumb but i have entered the code for this as you have shown on the site in the notes tab, only difference is used my characters name (also what i saved is SV actor as) instead of the actor2_2 like you have on yours and it does not seem to be showing up. do you have an idea as to what i am doing wrong? Try saving the game before playtesting. I’m not sure if newly added plugins might not take effect during battle test until you save. Check if there is a compatibility issue with another plugin. I need help, the enemy is jumping me, if he does he turns around at the time of attack, what do I do? Disable other plugins that are not required and see if it still occurs. Maybe there is a conflict. 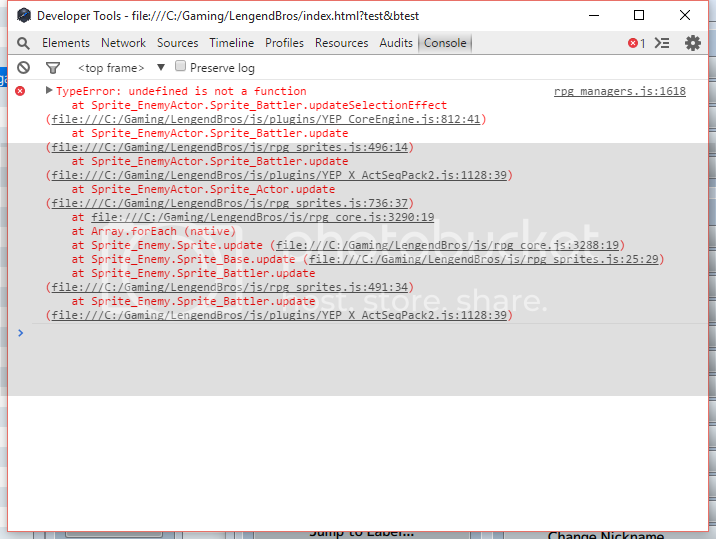 Can I get anyone that’s having undefined method error issues to press F8 before battle to open the console and then take a screenshot of the error? It should show a bunch of red lines detailing where it crashed. Looks like by the look of it, yanfly’s engine makes conflict with your enemy sideview script. Perhaps I still have the old one? Yes, this plugin does not work with yanfly’s battle engine. He has released his own animated enemies plugin however so I would recommend just using that. Oh well… looks like I have to choose between script packs. Thanks for the answer. gotta see the rest of the scripts then. Keep up the good work. I have the same error, and in new projects that no other plug-ins, my party is invisible. Please forgive me for Google translator. please update the two plugins, as well as Enemy Equips and Core Equip Slots and see if it works. Hey there, I love all of your plugins but I’ve come across a problem with this one. I’ve done everything you say to do and it all works perfectly in the game right up until I try to attack them, then I get a “TypeError: undefined is not a function” message across my screen. I can do everything else that doesn’t involve me targeting them (eg: casting spells on my own party) and they will also fight on their turn like the plugin allows but the moment I click attack and try to attack them, that error pops up and stops the game. Any idea as to how I can fix this? Does this work with all other plugins disabled? If you're using the weapons add-on, do you have equip slots core installed as well? Yes it works with everything else turned off and so I tried to only turn on YEP_CoreEngine plugin and I got the error again. I know you mentioned somewhere it wasn’t able to work correctly with the battle core. Is it not compatible with yenfly’s core engine? It works for me with yanfly’s core engine. Are you using the trial version of MV? No, I am using a full version of the game and I even just updated all of my YEP plugins to make sure that wasn’t the problem either. It still only seems to be yenflys core engine that is conflicting with it. Sorry for the hassle but I thank you for your time to help with this. Let me try it with the latest version of MV. It seems like there have been some updates to the core files. I am unable to reproduce it. Can you put together a new project demonstrating the issue? Preferably under 10 MB. Remove all img and audio and only have the sprites that are needed. I can’t reproduce it on a new project either so I’m doing something wrong in my current file. It works fine when I start a new project. Guess I need to do some digging. Hi I’m having an issue with this plugin…for some reason every time an enemy goes to attack i get a type error saying “undefined is not a function”. I have followed all of your instructions so i don’t know what the problem is…if you could help that would be amazing. Does this work with all other plugins disabled? If you’re using the weapons add-on, do you have equip slots core installed as well? I have all the plugins including the equip slot core and I tested it without the other plugins and I get the same error.